Like many older homes, this 1890s house in Excelsior has a small sun porch on the front that the owners had been using for storage. But even empty, this small room with gray indoor-outdoor carpeting speckled with rust stains, dingy white walls and vinyl mini-blinds did little to captivate a prospective buyer's imagination. It was so grubby that visitors didn't even notice the etched-glass front door or the porch swing. "There was nothing appealing enough about it to positively influence a buyer's decision, and that was the problem," said Lori Matzke of Centerstagehome.com. "It was just kind of cold, bleak and blah." Matzke said that whether your front entry leads directly into a small living room or a grand foyer, you have to impress a buyer immediately. 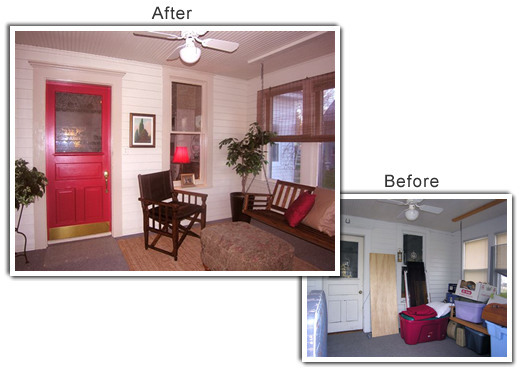 Here's what she did to warm up the front entrance and sun porch and create a positive first impression. Boxed the clutter and stored it in a far corner of the basement. To downplay the gray carpeting and make the space feel more inviting, Matzke painted the ceiling, woodwork and walls in a soft shade of putty gray with a yellow undertone. To create a stronger connection between the porch and the rest of the house, she painted the trim around the window and front door the same high-gloss beige used throughout the rest of the house. And to draw attention to the door, she painted it bright red and replaced a worn doorknob with a decorative pull and added a shiny brass kickplate at the bottom that matches the exterior hardware. Matzke removed the rust stains with a colorfast stain remover and though she normally doesn't like to layer rugs, she put a natural seagrass rug over the top of the indoor/outdoor carpeting to give the room some warmth. Because the entry looks out onto a busy street, the room needed window treatments. She replaced the blinds with inexpensive bamboo shades that provide privacy but let some light seep into the room. Rather than use a single shade for each of the 10 windows, she used large shades that each cover three windows. "Individual shades made the space feel too complicated," she said. "Larger shades made the space feel more polished." Matzke stained the unfinished porch swing with a dark-walnut varnish to make it feel like an attractive piece of furniture and to add some contrast to the neutral backdrop. Red and toffee-colored silk pillows help warm the wood. Matzke furnished the room with a leather director's chair and an upholstered ottoman that serves as a small coffee table; both were borrowed from other rooms in the house. A small table lamp with a red shade, bright artwork and a ficus tree add color and interest.